MILWAUKEE--(BUSINESS WIRE)--Apr. 17, 2018-- Marcus® Hotels & Resorts, a nationally recognized hotel owner and management company and division of The Marcus Corporation (NYSE: MCS), today announced it has assumed management of the DoubleTree by Hilton Hotel El Paso Downtown in El Paso, Texas, effective April 4, 2018. The company has also been selected to manage the newly constructed Courtyard by Marriott El Paso Downtown/Convention Center, opening June 2018. The two hotels are located within the same block in downtown El Paso. More than 70 Fortune 500 companies have offices in El Paso. Located only five minutes from the Mexican border, the city is the second-busiest international crossing point in the U.S. for business and commerce. 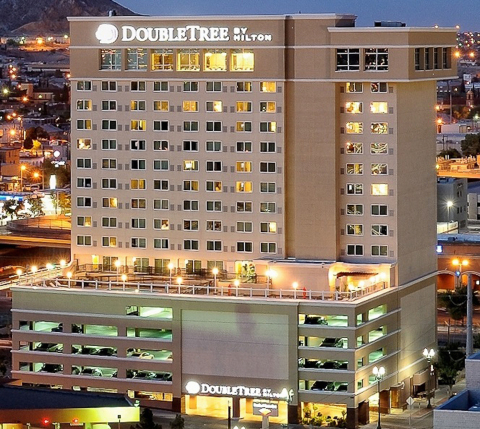 Situated in El Paso’s Museum District, near the city’s prominent convention and performing arts center, the 200-room DoubleTree by Hilton Hotel El Paso Downtown features a rooftop pool and sun deck with stunning views of the El Paso skyline, along with 8,500 square feet of meeting space that can accommodate small to large groups and weddings. The Fire Restaurant and Fire Bar is a full-service bar and restaurant serving Southwestern cuisine with craft cocktails, and offers live music throughout the week. The hotel also features a Mediterranean-inspired terrace bar, the Sunset Terrace, which offers specialty cocktails and brick-oven specialties along with a spectacular view of the El Paso skyline. The new 151-room, nine-story Courtyard by Marriott El Paso Downtown/Convention Center will feature the Courtyard by Marriott’s latest contemporary design, including an innovative lobby space and trendy, yet comfortable guest accommodations. Incorporating indirect lighting and a neutral color palette, as well as integrated technology throughout the property, guests will enjoy the relaxing modern feel and creative elements. Guests can plan intimate gatherings in the hotel’s meeting space as well as enjoy the property’s outdoor terrace-top pool with beautiful views of downtown El Paso. The hotel will feature the Bistro, offering a wide variety of “made to order” breakfast and dinner items, “grab and go” options and an assortment of cocktails and refreshments. For more information and to book a reservation, please visit the DoubleTree by Hilton Hotel El Paso Downtown’s website and the Courtyard by Marriott El Paso Downtown/Convention Center’s website. With the addition of the DoubleTree by Hilton Hotel El Paso Downtown and the Courtyard by Marriott El Paso Downtown/Convention Center, which will open in June 2018, Marcus Hotels & Resorts will own and/or manage 21 hotels, resorts and other properties in the U.S. The company’s distinctive portfolio includes city-center meeting hotels, upscale resorts, historic properties, and premium branded and independent first-class hotels. Marcus Hotels & Resorts is an approved operator for all major lodging brands. A leader in the hospitality industry since 1962, Marcus Hotels & Resorts creates asset value for hotel owners through its expertise in management, development and product repositioning. This includes hotel food and beverage concepts developed by its Marcus Restaurant Group, featuring premier brands such as Mason Street Grill, ChopHouse, Miller Time Pub & Grill and SafeHouse Restaurants. For more information, please visit: http://www.marcushotels.com and follow the company on Facebook and Twitter (@MarcusHotels).